EnCorps! Video from Drum Corps International lets you watch select performances from your favorite Drum Corps International units. Available exclusively to DCI.org Fan Network Platinum Members, the EnCorps! Video presentation of the Division II & III World Championship Prelims event from Aug. 7 in Pasadena brings you almost four hours worth of drum corps performances from Divisions II & III. 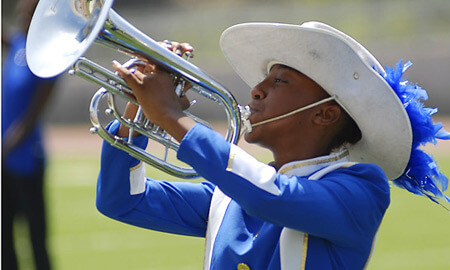 A member of Spirit of New Jersey performs at the World Championship Division II & III prelims. The last EnCorps! Video presentation of the season will be offered from the 2007 DCI World Championship Semifinals (Aug. 10) from Rose Bowl Stadium in Pasadena, Calif. You'll be able to enjoy individual corps performances over and over again from this event and others already posted from this season, all from the convenience of your computer. Purchase a Fan Network Platinum Membership for only $89. Already a Platinum Member? Watch EnCorps! Videos now!